The Horsehead Nebula is one of the showcase objects of the winter sky. It is located in the constellation of Orion just below the eastern-most of the three prominent stars in Orion's belt, which is the bright overexposed star center-left in this picture (north is to the left). The bright nebula just to the east, i.e. below, this bright star, aka Alnitak, is called the Flame Nebula. I have tried without success to view the Horsehead visually. The glowing background gas which makes the horsehead silhouette is very faint. 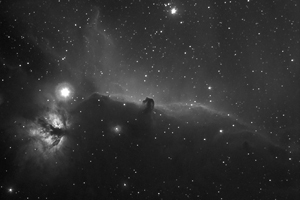 In fact, the Horsehead wasn't even discovered until 1888 when Williamina Fleming noticed it on a photographic plate taken at the Harvard College Observatory. So, it is with some pride that I was able to take the picture shown here with just a 200mm telephoto lens outfitted with a narrow-band H-alpha filter.